John Wesley Minerd was born on July 24, 1870 at Rogers Mills, Fayette County, PA, the son of Joel and Catherine (Seneff) Minerd. He and his wife spent the majority of their adult, married lives in Denver, Colorado, when the city had grown to become the third largest city west of Omaha, behind Los Angeles and San Francisco. John grew up in and around Rogers Mills into adulthood. In 1894, at the age of 24, he labored as a farmer, residing near Scottdale and Landersville, Westmoreland County, PA. He often spent his weekends home visiting his parents. On June 5, 1895, at Somerset, Somerset County, PA, John married Emma I. Landis (1865- ? ). He was age 24 at the time, and she 29, meaning John was five years younger than his wife. They did not have any children. By 1899, the Minerds were living at Wilmerding, Allegheny County, PA. John suffered from "erysipelas," and could not work for several weeks. They were still there in 1903 at the time of the death of John's brother David R. Minerd. At Christmas 1900, Emma surprised her mother in law with a special gift. Said the Connellsville Courier: "Mrs. Catherine Miner was made happy Christmas by receiving a handsome bedroom suite. She knew nothing of it until delivered at her home. It was presented to her by her daughter-in-law, Mrs. John Miner." At some point during the decade between 1900 and 1910, the Minerds migrated west to Colorado. John must have been attracted by opportunity for employment or perhaps a healthier climate. No Minerd or Seneff family members are known to have moved there before John and Emma did. In 1910, when the federal census was enumerated, John and Emma were shown to be making their home on South Grant Street in Denver. At the time, he worked as an electrician for a streetcar company. He made a long career in the field of urban transportation. Seen below is an old-fashioned, horse-drawn Denver streetcar used in the "pre-electricity" era. 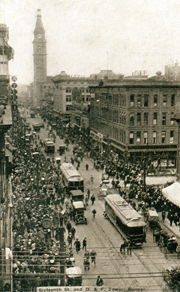 The image at right shows electrically powered streetcars along Denver's very busy 16th Street, more closely portraying a scene John would have known well. Note the Daniels & Fisher Department Store Tower in the background, the tallest structure west of the Mississippi River at that point in time, and still standing today. John and Emma were counted again in the census of 1920 as living in the city of Denver. 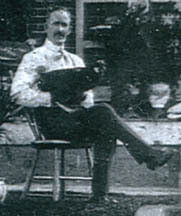 The record shows that John had moved into a position with the streetcar company as a conductor. 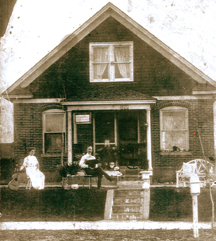 A photograph of the couple depicts them sitting in front of a dwelling at 2262 South Cherokee Street in Denver. A sign hanging from the porch identifies the property as "Rosedale Cottage." 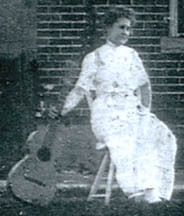 Both are sitting in chairs in the front lawn, with the entire house in view, with Emma holding a guitar and John holding what appears to be a turkey. The census of 1930 shows the couple making their home on South Cherokee Street, having been married for 35 years. They stated their net worth as $3,000, with John continuing his employment as a conductor on the "tramway." John passed away on May 13, 1947, at the age of 77. No details are known. The fate of Emma is lost to history. She is known to have sent a Christmas card to her husband's niece Maggie Dull in 1950, but after that she fades into history. More will be reported here when learned.